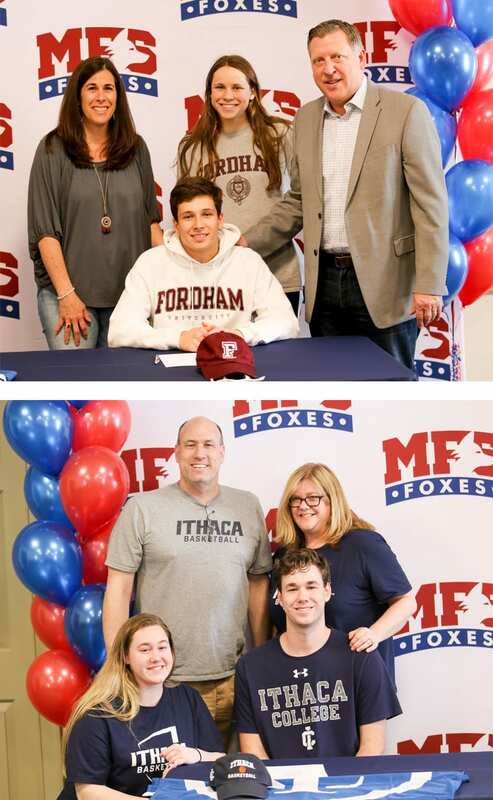 Evan Fenska ’19 has committed to Fordham University to become a member of the men’s swimming team. Evan is one the most successful male swimmers in school history. He holds school records in the 100 breaststroke, 100 backstroke, 100 butterfly, 50 freestyle, 100 freestyle, and 200 freestyle, and won the gold medal in the boys 200 freestyle at the 2018 Friends Schools League championships. Evan won silver medals in the 100 freestyle and 100 breaststroke in 2019 and in the 200 individual medley in 2017. He won the bronze medal in the 100 breaststroke in 2017 and in the 200 individual medley in 2016. Evan was also a member of three relays which won medals at the league championship meet during his four years. In 2019, he qualified for the prestigious NJSIAA state individual championships. For all four years of his career, Evan was selected as a First Team Friends Schools League all-star. Jack Stern ’19 has committed to Ithaca College to become a member of the men’s basketball team. He is the ninth boys’ basketball player since 1979 to reach the career 1,000-point plateau. He totaled 1,537 points over his four years as a varsity starter and this season averaged 23.8 points, 12.9 rebounds, and 4.7 blocked shots per game. All three of those averages placed him in the top 15 in the state. For his career, Jack tallied 854 rebounds and 289 blocked shots. During his senior year, he was named Honorable Mention All-South Jersey by the Philadelphia Inquirer, as well as an Honorable Mention Friends Schools League all-star. Also during his senior year, he recorded a few of the top statistical games in school history: Versus Maple Shade he scored 41 points and pulled down 19 rebounds; he scored 35 points and grabbed 18 rebounds versus Abington Friends; he scored 20 points, had 10 rebounds and 9 blocks versus league finalist Academy of the New Church; and against highly regarded league champion Westtown he recorded a triple double: 17 point, 11 rebounds and 10 blocks.